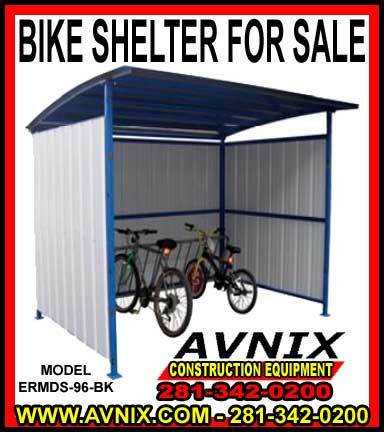 Avnix heavy duty steel bicycle shelters can be adapted for a wide range of diverse applications depending on your requirements. By adding a couple of doors to one side, it can be converted to a conventional storage shed that offers secure lockable storage space for storing lawn mowers and other outside equipment, while removal of the main wall and addition of a bicycle rack it makes the ideal bike shelter. Our bike shed are built of heavy duty steel that can stand up to the nastiest of weather conditions including rain, sleet and snow. The 18 gauge steel roof is designed for water drainage and will hold snow up to 45 lbs./sq-foot. 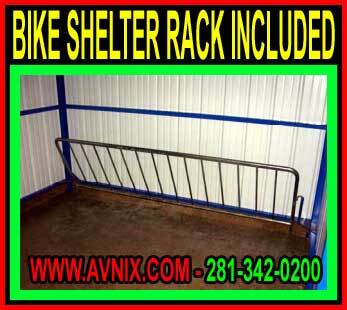 The bike shelter sides are constructed of 28 gauge steel siding. Usable size 109-1/4″W x 75-1/4″D x 80″H. Lag down plates are included for securing bike shelter to the cement. Bicycle Shed kit ships knock down, assembly required. Ensure that all employees understand and follow these instructions. Failure to read and understand owner’s manual before using or servicing constitutes a misuse of the product. All persons who will install, use, or care for this product must be familiar with this material. To Ensure that all information / safety / warning labels stay in place and are legible. Do not perform any modifications to the unit without the manufacturer’s approval. Failure to receive authorization for changes to the equipment will void the warranty. Maintenance and repairs are to be done only by personnel qualified to perform the required work. Consideration will not be given for warranty repair charges without prior written authorization by the manufacturer. Periodically inspect fasteners, welds and material for damage. Immediately decommission any unit deemed unsuitable for safe operation. WARNING – Failure to follow all instructions and warnings may result in serious injury or death. It is possible that this bicycle shed could incur damage during transport. Inspect the bike shelter closely when it arrives. If you see indication of damage or irregular handling to either the packaging or to the shelter when it is being unloaded, without delay make a make a note of it on the Bill Of Lading! It is essential that you remove the shelters packaging upon its arrival to make certain there is no hidden damage or to enable a timely claim with the carrier for freight damage. Also verify that the product and its specifications are as ordered.